So I just went on one of those trips you will never forget. The only downfall was my wife was not able to go with me on this one, but I had a blast touring the Southwest of the U.S. and capturing as much of it as I could. The trip started off by flying into Las Vegas. My plane was delayed 4 hours, but I knew I had a week, so I wasn't too upset, and even if I was what was I going to do about it? When I landed I picked up a red convertible (40 years old = mid-life crisis moment?) maybe haha. I got out of town as quick as I could and headed to the Valley of Fire about an hour outside of LV. The temperature was already 110+, so the top on the car went up about 2 hours into the trip so I didn't get to burned on the first day. I shot there for about 3 hours. Mainly driving everywhere and doing short walks. There was one place I wanted to capture that would have been about 45 minute walk each way, but it was too hot and there is NO shade out there, so I decided I better leave that for another trip (in the winter). 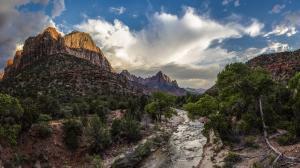 After I shot there I headed towards Zion National Park, and I had a room booked about a half hour outside of the park. I got dinner and rested and then the next morning I was up early. I got out of the hotel about 5:45 AM and drove to the park. No one was working the entrance station so I drove right in, parked and got on one of the shuttle busses that run constantly and every 15 minutes starting at 6AM (in the summer). I went to the furthest part, The Narrows. This is a 2 mile round trip hike on paved trails. Then you get into the water and walk as far as you can or want to from there. I took my tripod and camera and got into the water (up to your knees for awhile). I went around a few bends and capture some rocks in the water in long exposure using my 10 stop ND filter and some other shots. When I walked back and got out of the water I walked along the river the other direction and capture some more. I then got back on the shuttle and went to The Grotto stop and walked towards the Emerald Pools. I got turned around when I got to the pools and missed that stop but it was a beautiful walk along the upper rim, overlooking a lot of the valley. I capture a ton of photos up there, and walked to the Lodge, about a 2.5 mile hike, of up and down trails. After that I did a couple other smaller trails and called it a day around 2PM, because the heat was really starting to rise. The next morning I went back to the park (paid my entrance fee this time) and hiked some more trails, before leaving mid-day. I started the drive to Page Arizona. Alone the way I stopped and shot some different areas, including the Grand Staircase (From a distance). Once in Page AZ I was going to rest and go to the Horseshoe Bend at sunset, but the clouds looked fantastic, so I figured I would go to both, mid-day and sunset. It was close to 120 degrees and you have to walk up a small hill and then down a longer hill. I shot the Bend and it was stunning, clouds were great. I then had to walk back up that hill. This almost killed me. It would not have been bad, except I had just walked 15+ miles at Zion in the last couple days. So I was beat. It really wore me out. So by the the time I got back to the hotel, I was done for the night. I regreted going during the day, because the sunset looked beautiful from my room! The next morning I took a Hummer tour to the Antelope Canyons (a must) it was just myself and a family of two adults and 3 little kids. They drive you in a hummer and do some off roading on the way there and back. The tour guide tells you about the Rattler snakes and that the morning trip is the most common sightings of them. When we got there, I asked if I could go ahead as he was explaing everything to the kids. He said sure but really be careful of the snakes around every bend you must look and be careful. So I did. I had my tripod extended out (don't know what I would have done) but I had it ready just in case. I didn't see any and I made my way to the end of the canyon and started my way back, capturing long exposure shots along the way. We were able to be there for an hour in the Canyon, and it was just us 6 and the guide. I then made my way to the Grand Canyon. I drove the 25 miles inside the Grand Canyon National Park looking at the different sites, to choose the one I wanted to shoot sunset at. Of course it was the second spot I went to. So I went back the almost 25 miles and sat there waiting for sunset. As I did two big storms came rolling in. Making for some interesting photos. As sunset came so did that second storm. The rays were coming from sunset, and the lightning started. It felt like it was right on top of me, but in reality it was probably 25-50 miles away. I was able to capture some lighting strikes and a great sunset. I then drove about two hours outside the park and stopped in Seligman, Arizona the start of the longest remaining stretch of Route 66 (at least that's what I was told). I stayed the night and drove from there to Kingman AZ where that stretch ends. There are a few cool places to stop along the way, but Seligman was the best stop. After that I made my way to Vegas. I stopped at the Hoover Dam but there weren't any clouds in the sky, so it made for some boring photography. I spent the next 3 days in Vegas. I meet some friends, and walked around a lot capturing the different hotels / casinos. Did a little gambling. and relaxing. In all a great week that I will remember for a long time, and I got some great photos to help those memories live on. Check out the link to see more of my photos, and let me know what you think. Just about 5 years ago I was in Chicago shooting photos and decided to try my hand at long exposure photography. I grabbed my tri-pod and headed to Buckingham Fountain, and started to practice. It took me about 30 minutes to capture what I thought was a nice image. During this shoot I discovered "Blue Hour" which is actually only about 20 minutes, with most nights there being a 10 minute sweet spot. It happens about a half hour after sunset. Now it's my favorite time to shoot. I have been to countless cityscapes to shoot at Blue Hour. I love seeing other photographers at the same spot as me, they wait for sunset, take a few photos and leave. Meanwhile I stay or arrive right about then, and wait that other half hour. I wonder if they even know what Blue Hour is, or do they just really love sunsets. I find in cityscapes especially that most sunset are not that spectacular. Doing landscapes yes, you can get some great shots, especially if you can see the horizon. Anyways if you haven't tried staying past sunset to Blue Hour, give it a shot. Set your camera on a tripod, mess with the settings in manual and see what happens. Most of mine are shot at about 30 seconds with a variety of other setting depending on the shot. Give it a try and let me know what you think, and take a look at my site, and see plenty of examples. 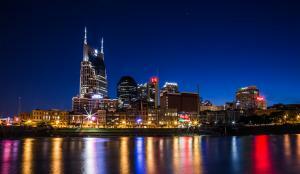 This is a image of Nashville TN.